A couple nights ago IY Ursa Majoris (IY UMa) went into outburst. This is one of those rare eclipsing CVs that astronomers really like to get data on, because with an eclipse you can tell the period of the system as the components orbit around each other. 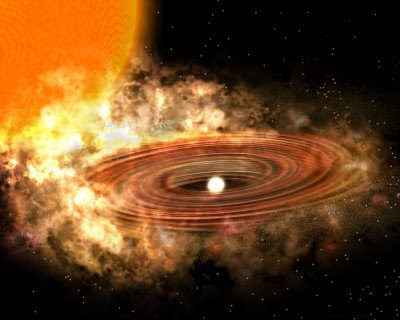 In a CV binary, one star is a white dwarf: a collapsed star of approximately one solar mass in the volume of the Earth. The other star is a red dwarf rather like our Sun, but redder and less massive. The red dwarf and the white dwarf orbit each other once every few hours: they are so close together that the average CV system would fit comfortably into our Sun. The red star in a CV is so close to the white dwarf that it becomes tidally distorted --- gas is stripped off the red star and falls towards the white dwarf. The infalling gas forms a disc -- an accretion disc -- with the white dwarf at its center. The gas in the disc spirals down towards the white dwarf, radiating its gravitational potential energy away as it goes. The accretion disc usually outshines both the red star and the white dwarf in visible light. When these systems go into outburst it is the material in the accretion disk falling onto the white dwarf and burning off in a giant explosion that we see as a brightening of the system. In some cases, the white dwarf and the red dwarf line up more or less to our line of sight, and as one passes in front of the other we see it dim as it is eclipsed. The disk can be eclipsed, the hot spot can be eclipsed, the white dwarf may be eclipsed, and from all these clues we can figure out a lot about these CVs. In order to get a firm handle on the period, it is best to observe and record at least two eclipses, if not more. Most CVs I monitor have orbital periods of anywhere from 90 mimutes to 3 hours. That means you need somewhere between 3 hours and 7 hours of clear weather to have a good run. The weather forecast was promising for Monday, so I got out and tried to grab an eclipse observation with the 12" LX200 and CCD camera. Below are my results. You can click on the image to see it up close. 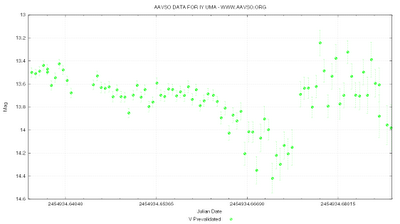 As you can see, I only got one eclipse, but it is pretty easy to see in this light curve. You can also see the affects of incoming clouds on the quality of my observations as the data gets noisier and noisier as the system was coming out of eclipse. When the error bars grew to 0.2 magnitudes I was shooting through thin clouds. With a little luck, I'll get two eclipses tonight.